Welcome to Love it Keep it, where I chat about something I’m currently lovin’ on. Right now I’m loving my DVR. It helps me record all of “my shows”. My favorite show right now is Modern Family on ABC. I know I’ve posted about this awesome show on here before, but I really need to bring it up again. This show rocks my socks off. It is hilarious. Last night’s episode was amazing. And even the husband loves it! Please, watch this show! Up next is Glee, on FOX. Seriously, who isn’t watching this fabulous show? I’ve been watching since day one and I’ve never been disappointed. Amazing singing? Check. Ridiculous dance moves? Check. Nerdy girl likes jock guy? Check. Cute curly hair glee club teacher? Check. What more could you want? And no list is complete without mention of The Office, on NBC. The husband and I are huge fans. I actually think that The Office and Modern Family are the only shows we agree on. Well and maybe Law & Order SVU. But that’s it. 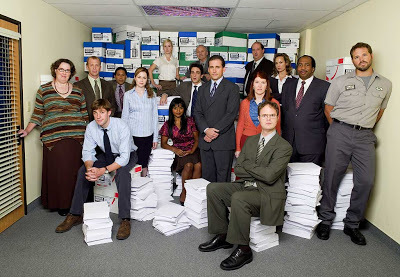 The Office is one of the few shows we actually make time to watch live instead of recorded. It’s that good. And oh how I love me some Jim Halpert! This season I’ve been a big fan of The Biggest Loser on NBC. I never really paid attention to past seasons, but for some reason I’m loving it now! I think I get teary after each episode. It is so inspirational. If a 400 pound man can run 5 miles so should I…right? I can’t wait for the finale. Go Ashley! Now for my guilty pleasure, The Real Housewives of New Jersey on Bravo. I can’t stop watching this show. It is ridiculous and fantastic at the same time. Of all the Real Housewives casts, this one is by far my favorite. So what shows are you lovin’ this week? Well, my guilty pleasure is reality TV, so I definitely can agree with your last two choices here. I have always watched Biggest Loser and this is one of the best season's so far. I was very happy with the final two and am voting (online) for Daris to be the third contestant. I watch all of the Real Housewives shows too – the woman I love to hate!! My two fav though are OC and NY. Omg. Real housewives is out of control. In an amazingly fun, can't stop watching way. And glee-best show EVER. And modern family? Possibly the funniest show on tv. I pimp it out to all my friends! Confession: I don't watch Glee. I probably would love it, but I just have too full of a schedule right now!! Hahaha! I'm also loving RHoNJ – they totally remind me of the original cast of RHOC which was the best show everrr.